What’s with the full-force gushing, the spit-mottled glottal-stop-&-go over Big Hoss? The pulled pork was so dry I thought I might have accidentally asked for pulled taffy. 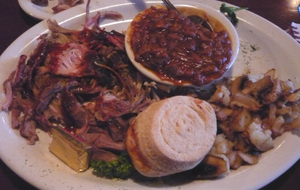 That’s what I got, the pork-taffy platter. Good thing my friend MO was there to drown out all the ballyhoo, spewing spot-on censure: “It’s not smoky, it’s not succulent, there aren’t any flecks of spice, there’s not that much sauce,” she said, wondering exactly what the pitmaster’s sense of the difference between barbecuing meat and just, you know, cooking it all the way through was. The “grilled Western veggies” mixed into the diced “campfire potatoes” were pretty much just onions & mushrooms; funny, because there’s another side dish called “onions & mushrooms,” which are caramelized & sauteed, respectively. Actually, fine & dandy—it’s all hash to me—but a little truth in advertising would have gone a longer way. I know, I know, you don’t go to a smokehouse for salad. But considering my jerky & MO’s middling andouille, I’m not so inclined to go for ‘cue either. They do make some mean baked beans, though, & some good greasy doodles. They should call it the Mean Bean & Greasy Doodle House. Then I’d go there lots. Came across your link from the La Pistola blog. I took 3 coworkers to Big Hoss for lunch last week because it won 3 of Westword’s “Best of” this year (It is also only a few blocks from my best friends house). The only “best of” I would give it is “Best of Mediocre run of the mill restaurants”. None of us particularly liked our meals. Like you said, the beans were ok, that’s about it. I’m a former employee of this trainwreck of a place. It is true, Hoss likes to booze it up and yell and scream at his employees during service and his food is mediocre at best, after all he uses charcoal instead of wood. If you go in, ask to see the pit- then take note how filthy the kitchen is. This is what you’re eating. Service is consistently awful because the guy runs off all of his employees that don’t laugh at all his racist, sexist jokes. I’ve had my doubts about “best of” before, but with this vote, now I know it’s a sham. Eff Big Hoss BBQ. From your description of rampant mediocrity, it sounds as if the owner is trying to establish a “concept” that can be franchised. It was all the qualities that chains seem to display. Are the menus laminated in plastic? Just another example that Jason Sheehan doesn’t know what the hell he is talking about. I agree with the above reviews. The food does not warrant the inflated prices. I have heard more than one employee complain of being verbally abused and even sexually harrassed by Hoss and his tool of a brother, Jeff. I am baffled that they get any business at all..but I guess people love mediocrity…its safe and it doesn’t challenge them in any way.